Iceland fish play a big role in income and earnings for the Icelandic people. We the Icelandic people are first and foremost fishermen. In early 1900 nearly 90% of the nation’s income came from the Icelandic fish. That confirm how rich the fishing grounds were around Iceland. Our forefathers went to sea on open small boats which would not be fit to go on a lake today. The fishing grounds were so rich of all kinds of fish, the fishermen had only to go very short distant form land to find good fishing grounds. With modern fishing gear the fishing grounds have been destroyed so now fishermen have to go further to fish. In Icelandic fishing grounds we have found around 320 species of Iceland fish many of those fish are vagabond and others are deep sea species and are seldom caught. Latter day more rare fish have been caught the main reason for this is modern and powerful fishing gear and fishing in deeper ground. Two of most fished species in early 1900 were cod and herring but later that century the herring disappearance for some years and fishermen began to fish capelin (very small fish) instead. We fish around 30 species in some quantity. It is likely that Icelandic fishermen begin to fish new species in the future because we have strict fisheries management. The newest addition is tuna fishing but the future will decide if this fishing is profitable. A report “Undesirable substances in seafood products – results from the monitoring activities in 2006”. Matis an Icelandic research company is the author and the report shows that there is verly little pollution in Icelandic fish. The pollution is much lower than EU criteria. 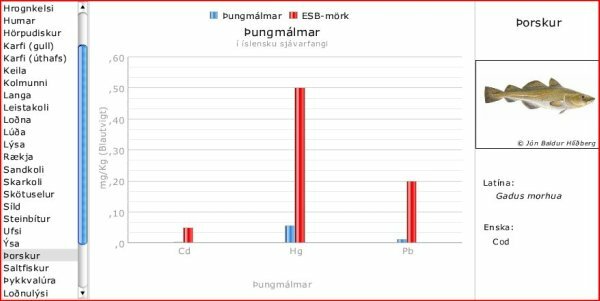 Below is a picture of pollution found in cod fished in Icelandic fishing ground. How do we eat the Iceland fish that is caught around Iceland? When I was growing up we used to get boiled haddock every lunch and at night we got some meet. Sometimes on Saturdays we had salted cod for lunch. For relief we got salted haddock or smoked haddock, but my favored was fried haddock. If you are going to have fish for dinner here are some tips on how to cook a good fish meal.